How to race your heart out and be done in time for brunch. In the movie Miss Congeniality, a beauty-contest judge played by William Shatner asks Ms. Rhode Island to describe her perfect date. To me, trail half-marathons are the April 25 of race distances: Not too short, not too long. You show up, often explore most of the trails in a local park, and get to have your snack of choice (beer for recovery) before some of your friends even wake up (recovery from beer). It’s not just the experience of racing that makes trail half-marathons ideal, it’s also the versatile training they support. A strong trail half requires low-level aerobic fitness, well-developed running economy on hills and flats, and a good lactate threshold to maintain a strong tempo. The same goes for shorter distances like trail 10Ks or 5Ks. Those adaptations can all lead to compounded gains over time, with each training cycle leading to more speed without the breakdown and slowdown often seen in longer distances. Trail half-marathons (and shorter distances) are freaking fun to train for and race independent of long-term goals. It may be helpful to think of two hypothetical athletes of equal genetic potential and training time. Athlete One goes straight to 50-milers and gets proficient at the demands of long ultras. Athlete Two spends a few years doing trail halfs and similar distances, working on speed. We’d all take Athlete One in a head-to-head at 50 miles and Athlete Two at a half. But who do you take five years from now at 50 miles and half-marathon, assuming both athletes committed equally to the events? I’d take Athlete Two for both. That running economy they developed will usually transfer to longer distances with specific training. It’s a phenomenon seen all the time in track and road racing, where the old adage is that it’s easier to move up in distance than it is to move back down. Eliud Kipchoge, the best marathoner in human history (there may have been some velociraptors with better splits), began his career as a world beater on the track. Most coaches would say that going straight to the marathon would have been less productive for him long-term prior to fully developing his running economy at shorter distances. 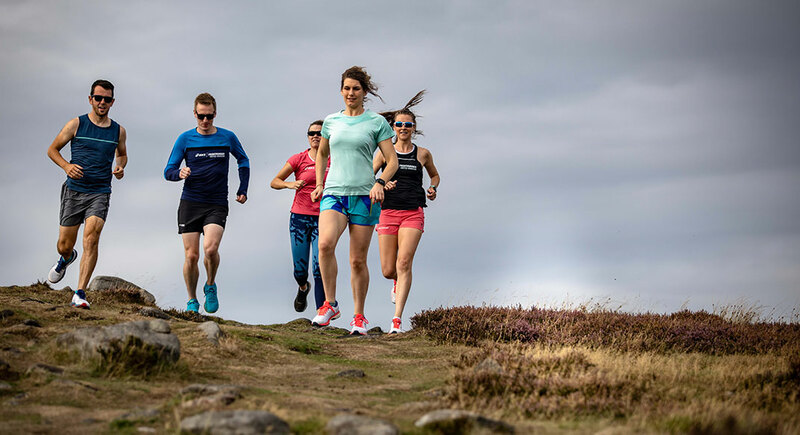 The same principles probably apply to trail running, where ultra champions like Magda Boulet, Matt Daniels, Rob Krar and Jim Walmsley were blazing fast on the track in their formative years. While that guideline doesn’t apply to everyone, it doesn’t have to. Trail half-marathons (and shorter distances) are freaking fun to train for and race independent of long-term goals. Distance doesn’t determine value. Sticking to distances half-marathon and below doesn’t make you any less of a runner. In fact, it may make you even stronger long-term. And it’s the perfect place to start. 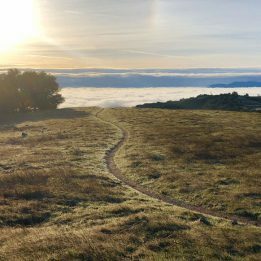 On last week’s article on training for your first ultra, a helpful reader commented, “Why does it always have to be about ultras?” That was a great point, so I want to make it clear: It doesn’t, and it isn’t. 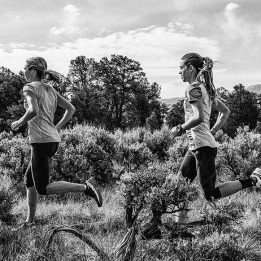 That’s especially true for beginner athletes (the plan at the end of this article is designed for a beginner/intermediate athlete starting at a healthy 15 miles per week). As you get started with your journey in half-marathons and below, there are three major principles to think about. Easy running is the key to unlock long-term aerobic potential. The prototypical example from the track/road running world is the training methodology used by many top U.S. athletes in the 1990s, which called for lots of speed work and hard workouts. It’s impossible to ascribe a thought process to a whole group of coaches and athletes, but the general thinking seems to be that the only way to get fast enough to compete with the athletes dominating on the international stage was to pound out astronomical volumes of intensity. In the process, aerobic volume like what was popular during the U.S. running boom of the 1970s fell out of favor. And with the transition, U.S. international performances took a major hit. Since that time, U.S. athletes have generally embraced more running and a reduced proportion of intensity (with outliers in both directions). With that shift in focus came an international resurgence and increased depth of elite performers. Now, that is admittedly an oversimplified narrative based on elite athletes, but most runners who have had breakthroughs at all levels have stories to tell about the Trial of Miles, that mythical time dedicated to building up aerobic endurance through lots of running. A good example is Steve Tucker, an athlete who hovered around 20 to 30 miles per week average back in 2016, with lots of moderate or hard running mixed in. In 2017, he gradually increased his training volume to two and sometimes three times that. In eight months, he set PRs at every distance, from the 5K to the 50 Mile, and even won The North Face 50 DC. Especially as you’re starting out on your trail-race journey, higher volume of aerobic running strengthens the musculoskeletal system, increases capillary density to supply fuel to working muscles and improves the proportion of Type I slow-twitch muscle fibers that power endurance performance. With those adaptations, you’ll be able to do stronger workouts later. If hard running and racing is lighting the fire, easy running is gathering the kindling. In your training, that doesn’t mean you have to run all day, just that you should prioritize frequency of easy runs. Work up to four to six easy runs a week before worrying too much about going hard, doing a couple runs a week on trails to prepare for the biomechanical and neuromuscular demands of racing. The plan below starts with an athlete averaging 15 miles per week on five runs. Some people have favorite movies. I have favorite exercise-science studies. On a related note, I don’t get out much. My all-time #1 study came out in 2018 in the journal Physiology Reports. That study had 14 male and six female trained runners undergo a 40-day protocol where they completed 10 short workouts consisting of 5 to 10 x 30 seconds fast, supplemented by easy running (but reduced volume by 36%). What do you think happened? Instead, something crazy happened . . . breakthroughs. Running economy at 60% of VO2 max (a relatively relaxed, long-distance effort) improved by 2%. Performance in a 10K time trial improved by 3.2% (and by even more in a glycogen-depleted state, indicating enhanced metabolic efficiency). They went faster with less effort while running less and doing minor amounts of speed endurance work. Other studies back up the findings. And it’s something athletes have known for years—short, fast bouts of running improve biomechanical and neuromuscular efficiency even at slower paces (something those cyclists don’t have to worry about, since the machine doesn’t care all that much about how you transfer power as long as you mash on the pedals hard enough). The study took it a step further and showed that even if no other high-intensity workouts are completed, the improvement in running economy can make performance skyrocket in some athletes. Most likely, that will improve climbing ability too, even without any focused climbing intervals in training. In my experience, this principle is even more important in athletes that are just starting out, who have big leaps to make initially by learning to run fast. In your training, consider adding two to three days of strides per week consisting of 15 to 30 seconds fast, on hills or flats. Ease into them to avoid pulling a muscle, and focus on smooth form rather than sprinting like an ostrich with hemorrhoids. I have seen beginner and intermediate athletes improve their easy paces by 10+% in just a month or two by introducing strides. That’s why the first four weeks of the plan have bunches of strides before introducing higher volumes of intensity. 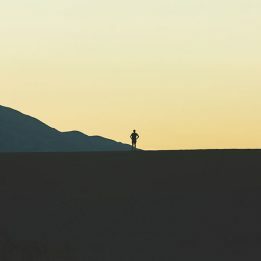 This may be sacrilege to some out there, but I think traditional, intense structured workouts are not the most important thing for beginner or intermediate trail runners. There are a few big reasons for that. First, a lot of the low-hanging fruit of initial development can be grabbed just by running a bit more and learning to run fast. Second, many trail runners will venture into moderate efforts to run up hills. Third, workouts raise stress, and with it comes elevated injury risk. That being said, workouts are important to make sure the exertion of race day leads to efficient running. The first element to think about is your VO2 max, the maximum amount of oxygen an athlete can use in an incremental exercise test, generally corresponding to a 10ish-minute effort (strong emphasis on the “ish,” since different sources say different things). VO2 max is a largely genetic metric that can improve by a certain amount at first, but future performance gains are explained by other factors. It doesn’t require that much high-intensity work to make that number ring the genetic bell like you’re playing one of those games with a sledgehammer at the circus. For beginners, it’s important to do some high-intensity intervals, usually under three minutes with around equal time recovery, to improve running economy. But intentionally raising VO2 max is not in the list of top-20 most important training elements (see this great post by top coach Steve Magness for more). Lactate threshold, meanwhile, has more potential for long-term improvement. LT corresponds approximately to an effort you could sustain for 1-hour. Exceed lactate threshold, and recent studies show subsequent performance may be diminished even with ample recovery time (like redlining on an uphill hoping to recover on the down, only to not have the same legs on the next climb). If you run easy and get fast, the study above with the 30 second bursts indicates you will likely improve your lactate threshold pace without too many hard workouts. Add some “tempo” running and cruise intervals at sustainably hard efforts, and you’ll unlock even greater levels of performance (and fun on climbs). In your training, the basic thing to know is that you don’t need to do that many hard workouts to support race performance. Think of yourself like a sponge that absorbs a certain amount of water. Pouring more water in won’t make the sponge absorb more. Your first need to wring it out with recovery and easy running to do more work later. And beginner athletes are working with a smaller sponge as they develop. In addition, don’t worry too much about the specific effort you’re putting out. I’m talking a lot about thresholds and inflection points, but the body doesn’t work that way in practice. Do consistent work, not too much, not too hard. Don’t sweat the specifics excessively. After an athlete has developed a base, most can get by with one workout a week, with total intensity ranging from 10 to 30 minutes total, split by recovery periods. It gets really complicated if we dig deeper, but most athletes don’t need to worry about that at first. Do what’s fun, use hills sometimes, practice running faster and stronger instead of harder. Do that, and you may find yourself capable of things you never thought possible. The sample plan below is designed for an athlete starting at 15 miles per week over five days, all of purely easy running. Work up to that gradually if you are just starting out, including run/walk. Like last week’s article on ultras, it may be too general to help anyone directly, but hopefully it can illustrate some of the principles for athletes starting their racing journey. (29 mi total) rest 3 mi easy 2 mi easy, 15 min mod/hard, 2 mi easy 3 mi easy rest 2 miles easy in AM Trail Half Marathon celebration!